We LOVE this White Almond Sour Cream Cake recipe from scratch. It is delicious, moist, and it holds up perfectly to fondant. This “WASC” cake has been one of our most popular scratch recipes on My Cake School over the years, and is definitely one of my favorites! You will notice in the photo that the cake itself is not stark white, due to the fact that we use the whole eggs (rather than just the egg whites), and butter instead of shortening. This gives us a soft yellow shade. I just love the balance of vanilla with a hint of almond in this flavorful recipe. However, as subtle as the almond flavoring is, if you are truly not a fan of almond, you are going to notice it. No worries! Simply leave out the almond flavoring and you will have an amazingly moist and flavorful White Sour Cream Cake! This White Almond Sour Cream Cake is amazing with so many different fillings and frostings. 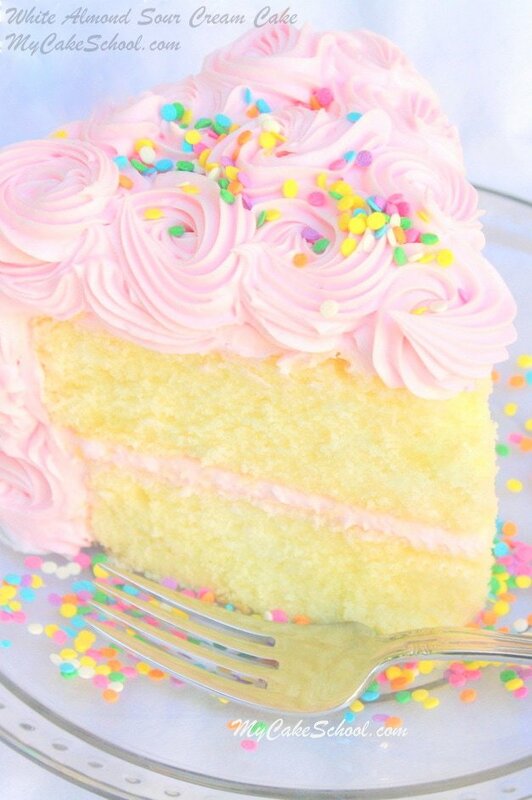 In the photo, we have frosted our cake with our Classic Vanilla Buttercream Frosting recipe. 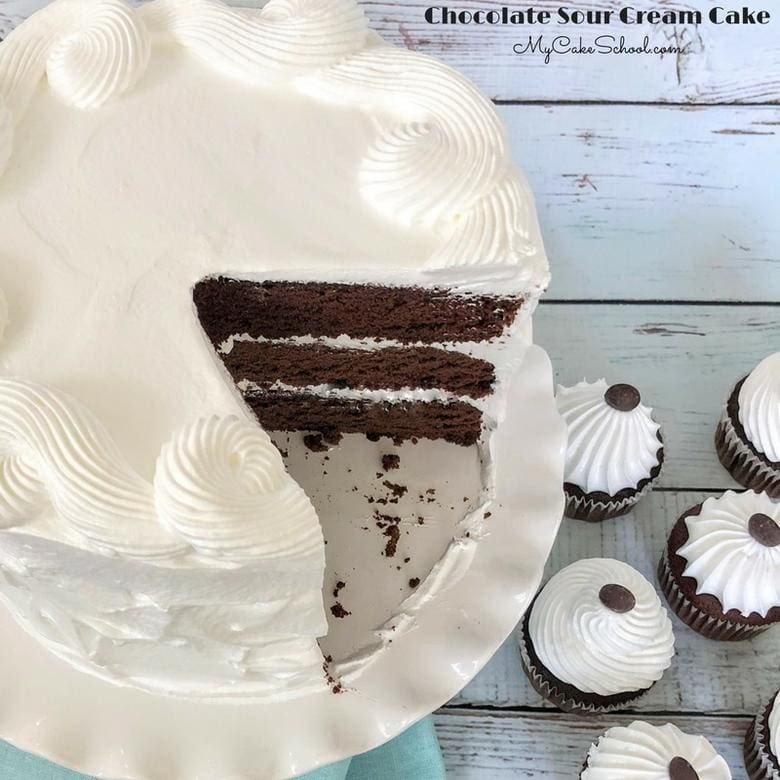 You can find a listing of our favorite frostings in the Frostings category of our Recipes section, there are so many that would pair perfectly with this wonderful cake! 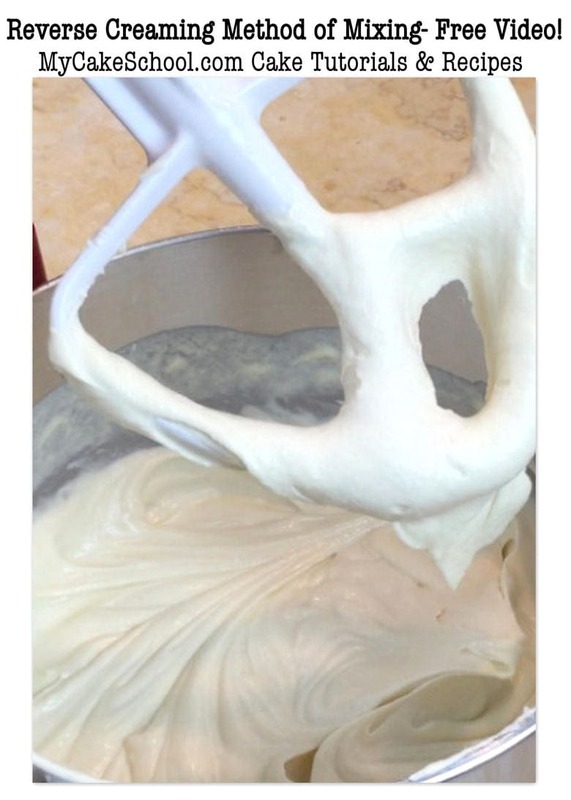 The mixing method used in this cake recipe is known as the Reverse Creaming Method. You will notice that the order that the ingredients are added is different than the traditional method of mixing. We have several cake recipes in our Recipes section that call for the Reverse Creaming Method. (We first read about this method in Rose Levy-Beranbaum’s The Cake Bible, and have been experimenting with incorporating it into many of our favorite cake recipes ever since). This method results in cakes that are slightly denser and have a velvety texture. For more information on the Reverse Creaming Method, you can find a link to our free cake video tutorial on the method at the bottom of this post! *If you prefer a fluffier texture to your cakes, you can find this same delicious White Almond Sour Cream Cake Recipe using the conventional method of mixing. This is also the recipe/mixing method that I use when making White Almond Sour Cream Cupcakes because they come out fluffier! : White Almond Sour Cream Cake Recipe (conventional method). We hope that you enjoy this amazing recipe! Please let us know if you have any questions! 1 1/2 sticks (12 T) (170g) unsalted butter, slightly softened (Do not soften in microwave). I cut the butter into 1/2 inch slices onto waxed paper and leave on the countertop 8 to 10 minutes. It will be soft enough to make a fingerprint in the butter and added to the dry ingredients a few pieces at a time. It is important to SLOWLY add approx. 1/2 of the egg mixture with the mixer on very low speed then increasing to medium speed for 1½ minutes -- the batter will be thick and fluffy. Scrape bottom and sides of bowl. Add the remaining egg mixture in 2 pourings, scraping the bowl and beating for 20 seconds after each addition. It is now ready to pour into pans. 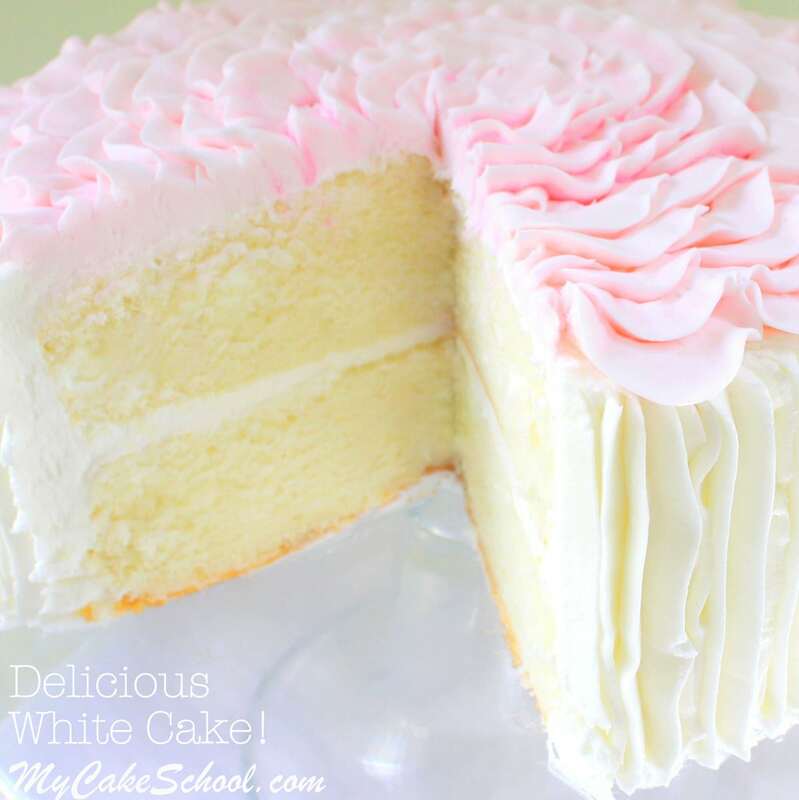 You may also like our White Cake Recipe from scratch! It’s another popular choice from our Recipes section! Super moist and slightly lighter in color due to the egg whites in the recipe. We love them both! Thanks for stopping by My Cake School! We hope you’ll visit again soon. Hi Christine, Yes, you can double the recipe. Looks delicious! How long would I bake cupcakes for? Hi Linda, For standard size cupcakes, bake at 350 degrees for 18 to 20 minutes, check at 18 minutes. The cupcakes will bake with a very slight dome. I want to try this recipe but it is difficult to find sour cream here in Greece… can I substitute this with buttermilk, sour milk or yoghurt? Hi Mihaelia, Yes, you can substitute yogurt for the sour cream. I prefer greek yogurt or regular plain yogurt. I hope you will enjoy the recipe. Can I turn this cake into a three layer cake? I just made this cake using the conventional method. I did a test run and made: 1-8″, 1 6″ and 1 cupcake. I like taller layers so I used a bit more batter per pan. Each layer rose to about 1 1/2″ tall. There was a small dome in the 6″. 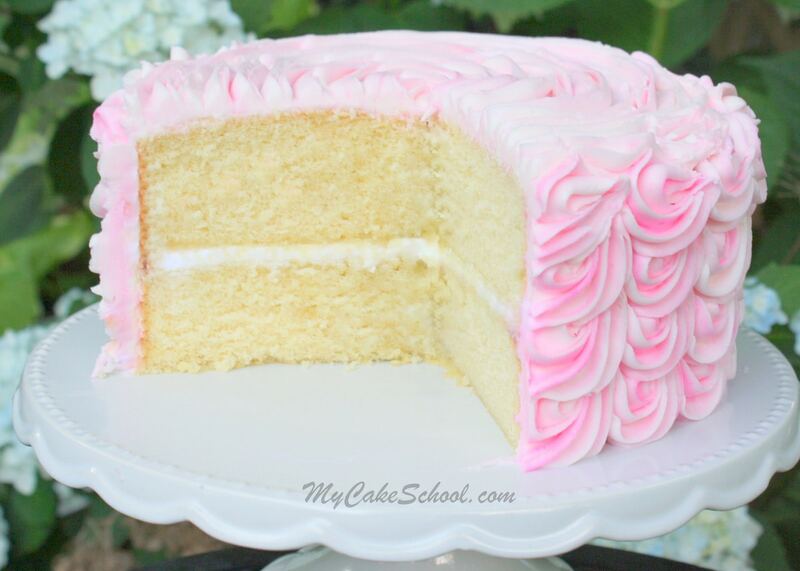 I like taller layers of cake in my cakes, but each layer could easily be torted. The cupcake was great. Slightest dome. No sticking to the paper liner. Dense but fine crumb, but fluffy too. Light color inside. Not white, but not yellow, and lighter than other vanilla’s I have made. I used the 2 tsp of vanilla, but changed the almond to 3/4 tsp. Very subtle. All in all, this will probably be my go to for vanilla and white. Thank you Melissa and BeBe! A question regarding my last post..to make this cake whiter in color, would the taste and texture change a lot if I eliminated the yolks, adding the whites only? I know I could use clear vanilla as well. 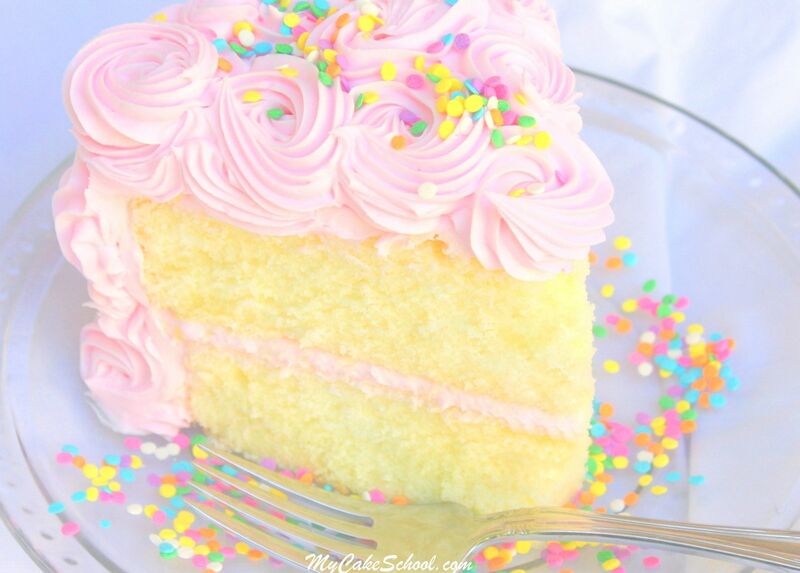 Very good cake! Thank you so much for your reply BeBe. I like your picture with your name! I would like to try your suggestion of the white cake with egg whites, but I do prefer the traditional method of mixing as opposed to the reverse method. Do you by chance have this recipe written as conventional? Thank you! I LOVE this recipe and get so many rave reviews when I use it (mind you I have never actually used the almond extract). I was just asked to make a lemon cake and I thought why not try this recipe with lemon extract instead of almond. Would it work? Do you know if I would use the same amount or a little bit more than a tsp? Thanks! Hi Carmel, I have not tried that but I think it should work. Our scratch lemon cake in the recipe section has no vanilla extract so I would leave out the vanilla and almond in this recipe and add 2 teaspoons lemon extract and also add the zest of 1 lemon. It is best to use a microplane to zest the lemon. Our lemon scratch recipe uses 1 Tablespoon lemon extract but it has 3 cups flour so I think you will be fine with just 2 teaspoons. It also has lemon juice but I don’t think you need to add that. We have tried making a lemon cake with just lemon juice but the lemon flavor was just not there. Hope all goes well. Would this cake freeze well? I want an almond cake for my wedding and it needs to be able to be made in advance and stay moist. Also, could I substitute part of the flour with almond meal? Hi Isabel, Congratulations on your upcoming wedding! Yes, the cake layers can be frozen. While the layers are still warm from the oven, wrap each layer individually in plastic wrap and then in aluminum foil, then freeze. Wrapping them will keep them airtight while frozen. To thaw, remove from the freezer, when condensation forms on top of the aluminum foil, unwrap and let them continue to thaw. You can crumb coat while the layers are partially frozen, if you like. I have never tried using almond meal so I don’t know if you would have a good result.